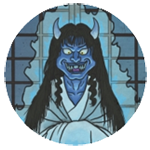 APPEARANCE: In Japanese folklore, almost anything, upon reaching an old age, can develop a spirit and become a yokai. 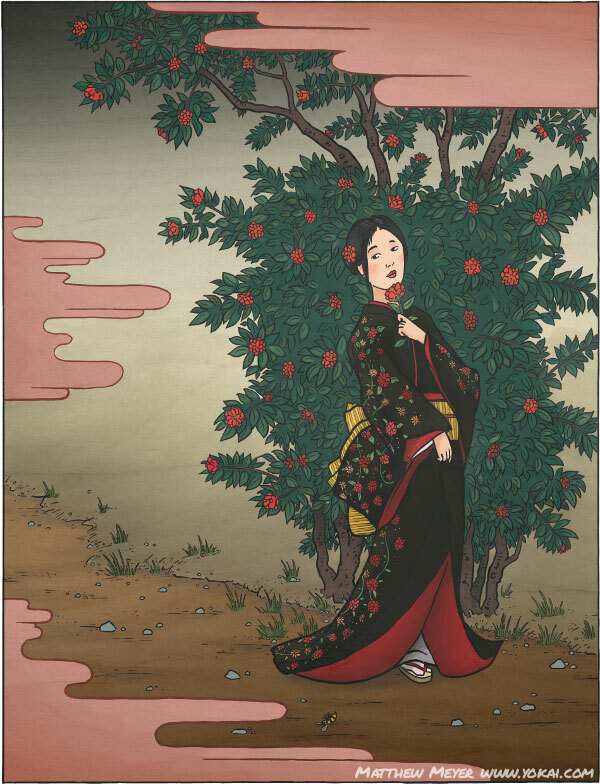 When a tsubaki tree (Camellia japonica, or the rose of winter) reaches an old age, it’s spirit gains the ability to separate itself from its host tree, along with other strange and mysterious powers, which it uses to bewitch and trick humans. ORIGIN: The tsubaki is an evergreen tree which has the strange behavior of not losing its flowers gradually, petal by petal, but dropping them all at once to the ground. As a result, it long been associated with death and strangeness in Japan (and is also taboo to bring as gifts to hospitals or sick people). LEGENDS: Long ago in Yamagata prefecture, two merchants were walking along a mountain road when they passed a tsubaki tree. Suddenly a beautiful young woman appeared from out of nowhere on the road beside one of the merchants. She breathed on him, and instantly he transformed into a bee. 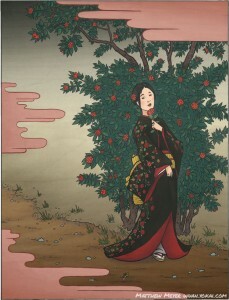 She then disappeared into the tsubaki tree, and the bee followed her and landed on a flower. The fragrance of the tree had turned into poison, however, and as soon as the bee smelled it, it dropped to the ground. The flower soon fell off of the tree too. The other merchant picked up both the bee and the flower and rushed to a nearby temple to save his friend. The priest recited prayers and read the sutras over the bee, but it sadly did not return to life or to its former human form. Afterwards, the surviving merchant buried the bee and the flower together. In Akita prefecture, long ago, a man heard a sad and lonely voice coming from the tree one night. A few days later, a disaster befell the temple. This happened again and again, and soon the priests at the temple realized that the tsubaki would cry a warning every time something bad was going to happen. The tree was dubbed Yonaki Tsubaki, or “night-crying tsubaki,” and still stands today in the temple Kanman-ji, where it has stood for over 700 years. In Ōgaki, Gifu, there is an ancient burial mound. One year, historians excavated the burial mound and discovered some ancient artifacts, including a mirror and some bones; however, shortly after the man who discovered the artifacts died. The locals blamed it on a curse, and returned the artifacts to the mound, planting a tsubaki on top of it. When the tsubaki grew old, it transformed into a yokai tree. Since then, the glowing figure of a young, beautiful woman has been seen by the roadside near the burial mound at night.